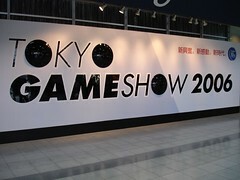 It is currently late Sunday evening here in Japan, and this year's Tokyo Game Show has taken its last breath. We have a couple of more videos to upload to our TGS Coverage on Xbox.com but there is no rest for the weary, as we hop a plane early tomorrow morning an head directly to X'06 in Barcelona, Spain. John over at the Gamerscore blog has a posted a lot of photos from the past few days, including one of my secrets to not getting ill when I travel. I did get adventurous on a sidetrip we all took down a back alley in Shinjuku to this hole-in-the-wall BBQ place. Lot's of scary looking stuff on sticks that you pointed to, and the nice lady cooked on an open pit grill in front of you. Here is a photo of me, sitting next to Community member K Rock XP looking quite puzzled at his mystery meat on a stick. That's John from the Gamerscoreblog standing in the back. Want to visit this place yourself? Well, you're in luck…since like everything in Japan, even this little place has their own website. The past three days have been filled with hundreds of games and thousands of people. The Xbox booth was always packed, with the wait to see 'Blue Dragon' as long as 90-minutes. I was able to snag an special invitation to the Sony briefing on Friday. All I have to say is that you really need to listen to the presentation yourself to really understand (or try to) what all the fuss was about. To their credit, the finally showed some pre-release games on the floor. At the Xbox Briefing, there were some nice announcements (1080p anyone?) that have gotten some good press but also opens up some questions that I need to get answered when I return to Redmond. Friday night, the Xbox Japan team held a community party that I was invited to. It turns out that Japan has their own version of 'Major Nelson' and his gamertag is Strawberrry. Yea, I was scratching my head to when I heard that as well…but he seemed to be well received by the local gamers. I made a mental note to talk to him about his Gamerscore. I was able to get some non-Japanese folks in to the party, including xSLOWMARx, Shipwreck75 and BonyT who are all in the American military but stationed here in Japan. As you'll see from the video on Xbox.com, Saturday was crazy. Much like the rest of Tokyo, THOUSANDS of people crammed into a relatively small space. This morning, I took a walk to the Park Hyatt Tokyo Hotel which is only about 5 blocks away from where I am staying. The Park Hyatt Tokyo is the hotel that was featured in 'Lost in Translation.' This is one of the most beautiful urban hotels in the world, with a view of Tokyo that simply cannot be described. I talked my way into the pool area on the 42nd floor (normally reserved for guests) to snap this photo. I then went up to the 52nd floor 'New York Grill & Bar' to snap this one. Following that side trip, I headed back to the Shinjuku area to hit one of their department stores to pick up a bathing suit since I wanted to hit the pool here at the hotel. This turned out to be a major problem. Why? I forgot that everything is measured in metric…and I have no idea what my waist size is in centimeters, but more importantly the only type of swim wear they had was Speedo, more specifically the Speedo racing line of swimwear. Perhaps they had a limited selection since were getting into the colder weather, but beyond the obvious reasons I decided against the purchase…fearing if I did, I would a) loose my dignity and b) start an international incident. So no swimming for me this trip. I was able to swing into their video game section, where I was pleased to find the Xbox 360 had a nice crowd around it, but what I was really after was 'Osu! Tatakae! Ouendan' which is a Japan only DS title. After a brief misunderstanding of what I was looking for, I finally scored my copy. If you plan on Travellling to Japan…pick up a phrase book. I am quite sure mine saved me from getting on the train to Yokohama instead of the Makurai Messe center, where TGS is held. It's time to pack, so I'll post some X'06 action when I get to Barcelona. Warning: I am not sure, but there is talk of me hosting the 'Bringing It Home' videos that will be up on Marketplace..so I may be visiting out in your living room in full 720p. You have been warned.